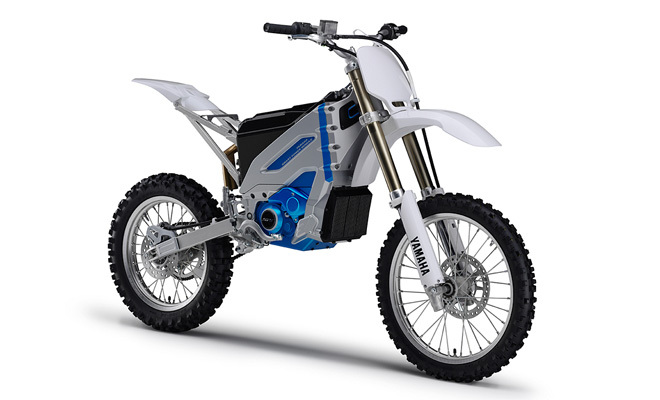 Motorcycle maker Yamaha popped up at the recent Tokyo Motor Show, unexpectedly exhibiting a prototype electric car that it may or may not put into production – see the earlier article about the Yamaha Motiv-e for details. At the same show it also displayed a pair of delicate electric motorcycles, again prototypes with an uncertain future, but arresting enough to merit a closer look. I may witter on about cars here at GreenMotor.co.uk, but I’ve always had an interest in two-wheelers and have even owned a few along the way, from a 50cc moped to a 500cc trail bike from which I could barely reach the ground. If I bought another, I’d love to go electric. 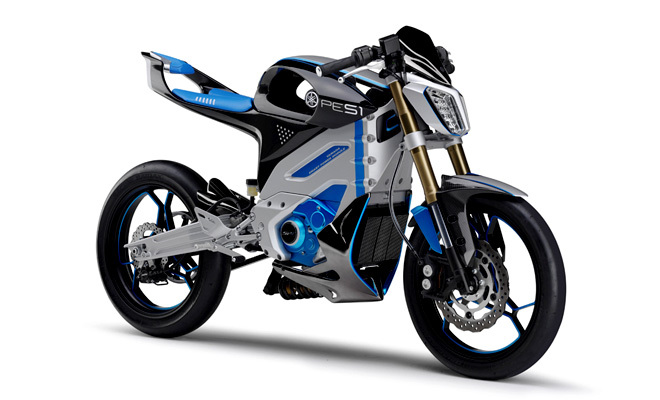 Yamaha’s PES1 and PED1 are two variants of the same basic structure, with wheels, forks, and other essential bits of hardware hung off a central power module. The module contains a removable battery and brushless DC motor, and also doubles as the structural frame. The fruit of this bolt-on approach is a pair of extremely light and lithe little motorcycles, despite the undoubted heft of the lithium-ion battery pack sitting in the middle. By the way, the “S” and “D” in the two names stand for Street and Dirt respectively, while the P is for Passion and the E for Electric. Aside from weights and dimensions, Yamaha hasn’t revealed much about the two bikes – battery capacity and motor outputs remain to be guessed at – but we do know that the PES1 goes like stink and makes a heck of a noise, screaming the high-pitched, ripped-canvas roar of a hard-working electric motor. And we know that because there’s a video, which you can watch lower down this page. 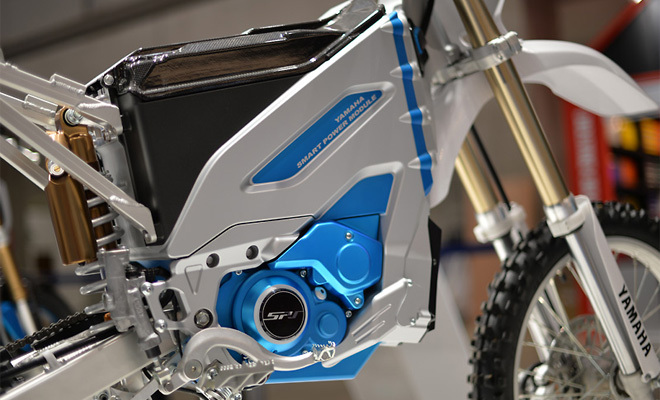 At less than 100kg for the street edition and 85kg for the trail bike, the pair are light even by the standards of petrol-powered equivalents. This is good, because as is the case with cars, less is more when it comes to eking out extra miles from the limited reserves of a battery, meaning slim and nimble is always preferable to big and bulky. Although there is always the snag that a light bike is all too easy for unscrupulous louts to hoik into the back of a van. That, alas, is what happened to my much-loved first motorcycle, a Kawasaki KMX125 that was there one day but mysteriously absent the next, despite my efforts to etch and tag its various vital parts to deter the light fingered. With today’s technology, investing in a tracking system from a company like Back 2 You might be an idea, especially if you happen to choose the most theft-prone bike in Britain, as I unwittingly did at the time. Once fitted with a tiny GPS module with micro-SIM card, an absent bike can phone home and tell you exactly where it’s been stashed. 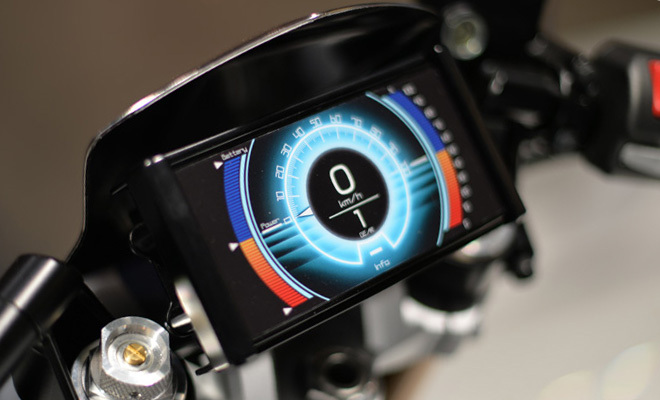 Of course electric vehicles are all about technology, and I note that the new Yamaha EV motorcycles feature a sort of iPad for an instrument panel, complete with the ability to swipe from screen to screen. It would be great if the coming generation of EV bikes like the PES1 and PED1 also featured an Apple-like ability to locate and remotely lock themselves. Remote control apps are already a feature of electric cars – you can monitor a charging battery or switch on the aircon in a Nissan Leaf from miles away, by iPhone, for example. The ability to pin down a missing bike would be all the more welcome. And if you think rare, unconventional electric bikes are somehow immune from theft due to their current state of extreme oddity – well, think again.